More than 3 million people in America suffer from epilepsy or seizures, and there are over 200,000 new cases of seizures and epilepsy each year. In about 75% of all epilepsy and seizure cases, there is no known cause. While the majority of cases of seizures and epilepsy are controlled with medication, more research is needed to understand the causes of seizures in order to prevent them. People with epilepsy are at a greater risk of injury from seizures and often have to modify their lives to live safely with a seizure disorder or epilepsy. 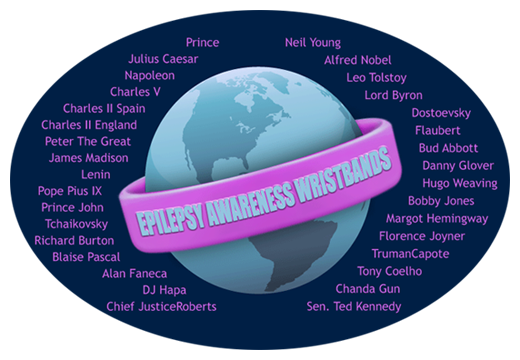 If you'd like to support someone suffering from seizures or epilepsy or raise funds for epilepsy research, you can purchase epilepsy awareness wristbands. 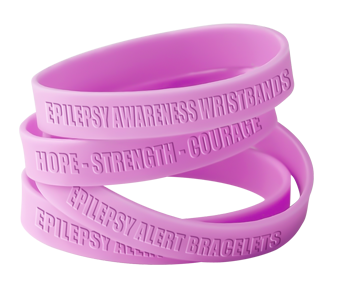 The recognized awareness color for epilepsy is "purple", but you can order customized epilepsy awareness rubber bracelets with your desired messages in a large variety of colors and texting styles. Personalize your silicone wristbands with a custom message that means something to you, or use a generic message such as "Support Epilepsy Research" or "Hope – Strength – Courage". Custom made wristbands can also be used as medical alert bracelets for people with epilepsy. Youdesign-custom-wristbands. There are no minimum order requirements here. All trendy silicone bracelets from www.AmazingWristbands.com are flexible, non-allergenic, durable, comfortable, water resistant, eye-catching, and soft. 45,000 children under the age of 15 develop epilepsy each year. Males are slightly more likely to develop epilepsy than females. 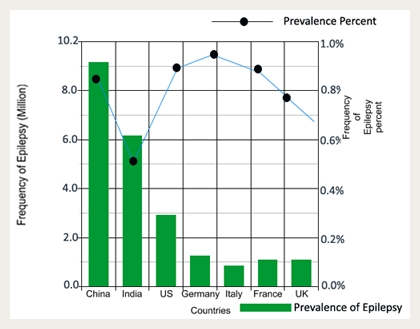 Incidence is greater in African American and socially disadvantaged populations. Trends show a decreased incidence in children and increased incidence in the elderly. Generalized seizures are more common in children under the age of 10; afterwards more than half of all new cases of epilepsy will have partial seizures.